Caesar salad dressing typically has anchovies. Some don't like the fishy taste. This delicious, easy, and budget friendly recipe is amazing. In a medium bowl, whisk olive oil, lemon juice, salt and pepper. 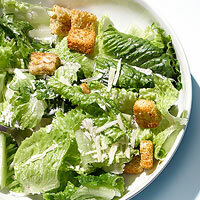 Toss with romaine, croutons and Parmesan.